rope selection, maintenance and storage. Please enquire about shipping costs. We aim to dispatch uncoloured rope next working day. The died ropes are dispatched within 2-3 working days. Our jute ropes are suitably soft, with optimum friction. 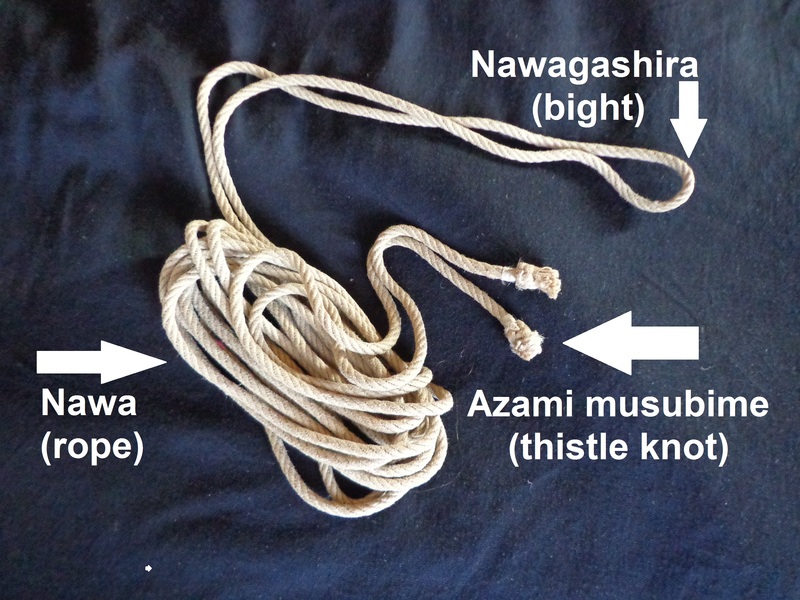 The tips are finished with a traditional azam musubime (thistle knot), short or frayed ends. The ropes are then treated with wax and tsubaki oil, a recipe of Japanese craftsmen. This gives the rope a pleasant aroma, a choice of fragrant oils are available.. The treatment lessens dustiness as well as shedding, reduces friction on the skin when drawing the rope through fast and significantly increases rope’s durability. Previously we have been asked for help in creating a set of ropes for people wishing to start their “rope journey”. We would suggest starting with a small set of jute ropes, which will allow you to improve your skills for a while, then it can be added to. In the beginning of your journey developing your skills, you will not to expect to perform suspension, 6mm rope is enough to start with. Ropes of this diameter (and even the trend now for using slightly thinner ropes – 5.5 mm) allow for the creation of more interesting ties and patterns. 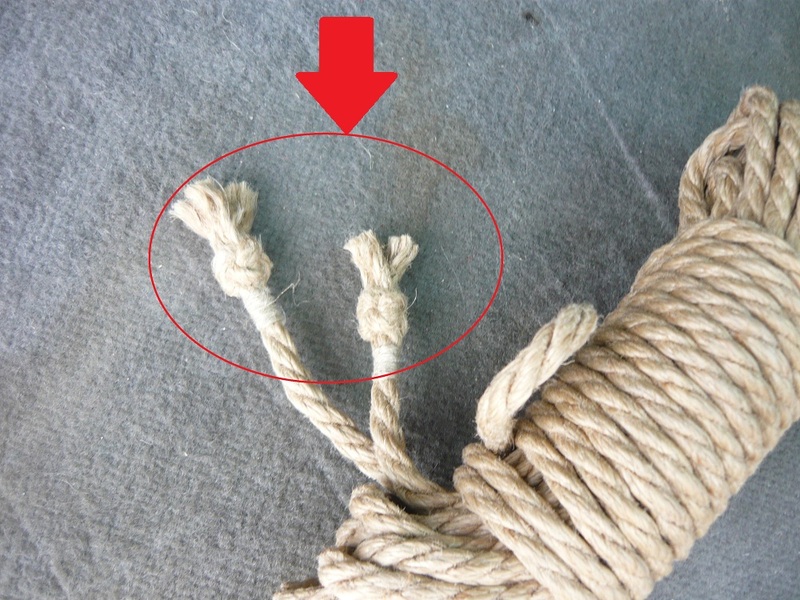 The resulting knots are clearly smaller than on ropes with a diameter of 8 mm. 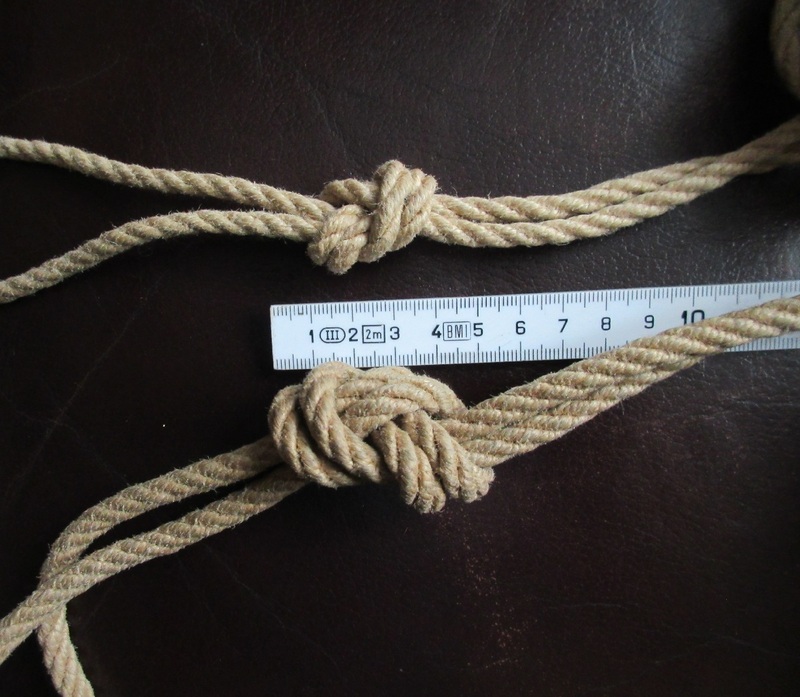 The picture below shows the difference in size of the same knot tied with 6 mm and 8 mm diameter ropes. through when tying. The practice of joining two ropes together is used to extend the rope. equipment, simple ties the of wrists and legs. We offer hemp ropes in 6-6.5mm diameter, in any length. We recommend hemp ropes to anyone who practices suspension. Ropes used for suspension must be very strong. 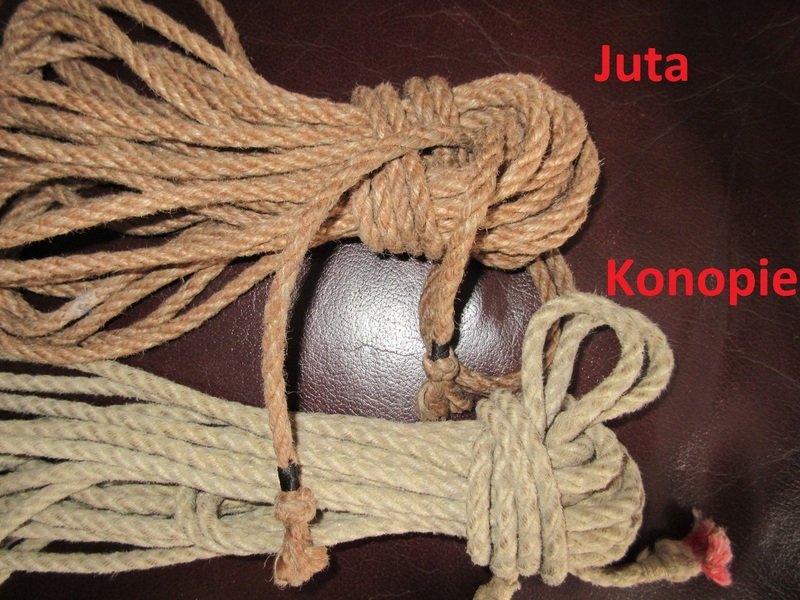 Jute ropes of 6mm (and the lesser 5-5.5mm) are generally not strong enough. For safety reasons jute ropes of 7-8mm are recommended for suspension. 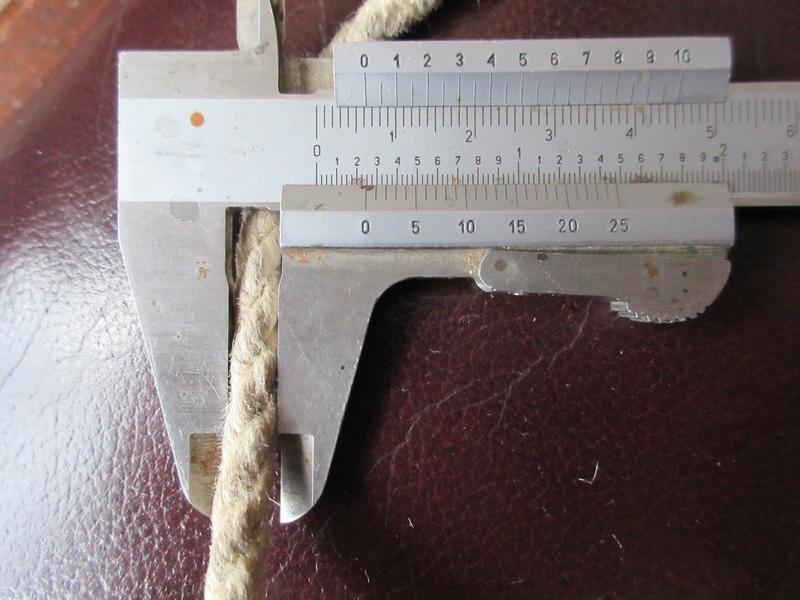 Although the rope is strong enough at this thickness the knots and weaves are bulky and not aesthetically pleasing. The solution to this problem is hemp rope about 6mm in diameter. Hemp rope of this diameter has a breaking strength similar to 8mm diameter jute. It is also more durable, less prone to abrasion, and consequently its strength does not decrease as fast as jute rope does. 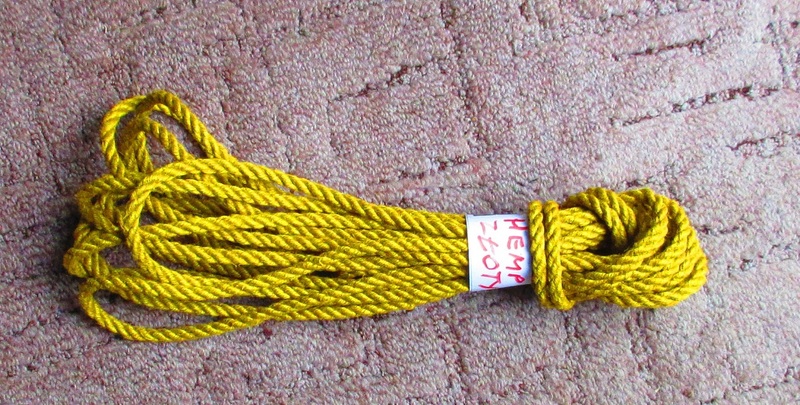 The characteristic of the hemp rope is its smell. 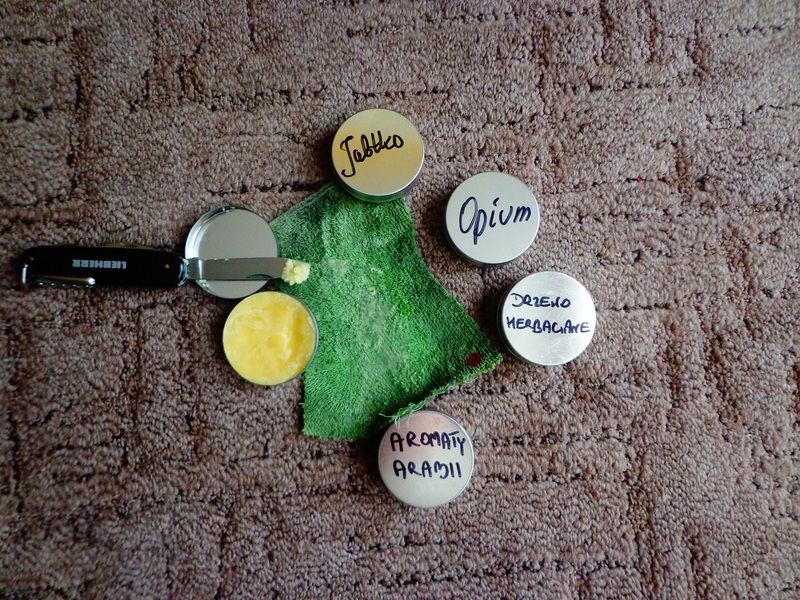 It is strong enough to break through even the aroma of our wax pastes and gives you an original blend. We offer hemp rope in natural colour, which is much brighter than jute rope. We can also make custom coloured hemp ropes on request. provide these. The basic colours are dark jute colour, red and black. These colours are ready for an immediate despatch. To special order we can also supply ropes from our vast colour selection. Please see the chart below. Latest addition to our rope selection are golden ropes. We offer a special wax for rope maintenance. Ropes made of natural fibres (jute, hemp, wool) lubricated from time to time have a unique scent. They are also more durable, acquire the right friction, get tangled less and have less tendency to burn the skin. Lubrication of ropes also reduces the shedding of fibres and dustiness. The price of one container of 30ml is 25PLN The content of one container is lasts for about 100 applications on 8m rope. Waxes offered by us are made according to the old rules of Japanese craftsmanship and are based on natural beeswax, tsubaki oil and other aromatic oils, if requested. Tins with 30ml of the selected paste, will be sent in secure packaging. Please enquire for postage costs. Jute and hemp ropes offered by us can be washed and cleaned. Fine impurities can be removed by wiping the rope with a cloth dipped in water with a hint of shampoo and tightly wrung out. The bigger stains can be removed by washing the rope like a cotton shirt. If you really want to they can even be boiled without fear of destroying the rope. The rope, after washing, should be dried under constant tension. If there are kinks in the places where the rope was attached, remove the rope wrap it around a round metal object (carabiner, eye, pole, etc.) and pull through several times. Ropes, after washing or from time to time, should be treated with a wax-based paste or oil. Light moisturising of the fibres extends the life of the rope, limits its shedding, reduces friction when pulled, and by the way, you can add an attractive aroma. Generally store like cotton clothes – in a dry, airy, sunexposed location. stretch them. To do this, attach one end of the rope to a fixed point. 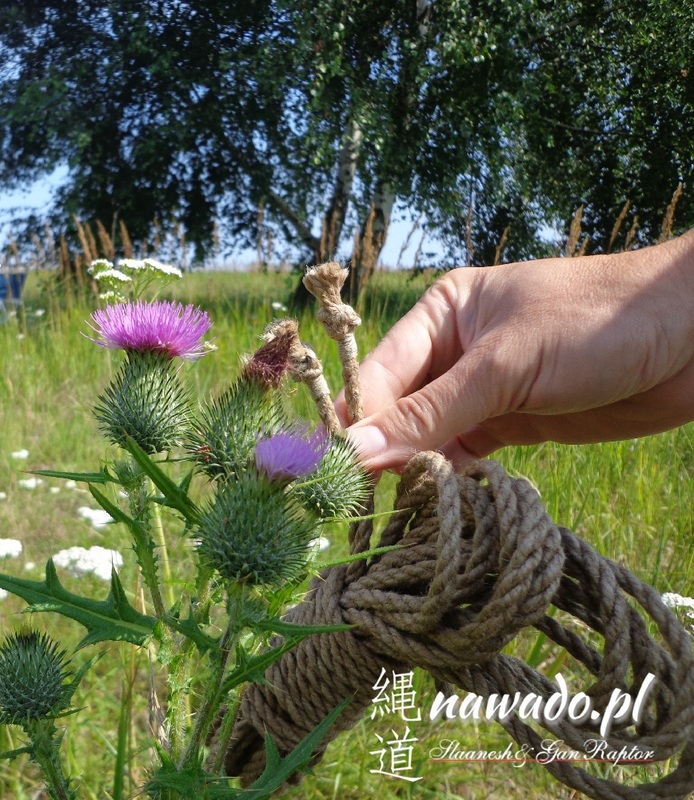 Tightly grip it with a piece of cloth so you not to burn your hand (you can use the wax at the same time) and pull the whole rope through the cloth to its free end. As you pull along the rope the free end will start to spin and release any tension.